Active Pest Solutions receives regular calls to deal with pest squirrels throughout Fife, Perth and Kinross-shire. We have 15 years of experience in squirrel control, and our reliable methods have never failed to achieve a positive outcome for our customers. Our specialist squirrel control operative has the equipment, training and experience to remove pest grey squirrels quickly, safely and effectively using professional pest control techniques while understanding the importance of taking the animals’ welfare into consideration. The fact that we are members of the Fife Trusted Trader Scheme and Perth and Kinross Better Business Partnership means our working practices, pest control qualifications, customer service and company integrity have been checked and assessed by trading standards officials, so you know you’ll get pest control you can trust. Grey squirrels are not native to the UK. Originally from America and introduced to Britain around 1876, they are known to carry a virus (squirrel Pox) that kills the UK’s indigenous red squirrels but does not affect their grey counterparts. Larger and more aggressive than red squirrels, grey squirrels establish themselves and breed very quickly, producing up to four litters a year with an average of three to four young per litter. The relentless growth of the grey squirrel population has driven red squirrels out of their native territories and significantly diminished the population. In Perth and Kinross and in parts of Fife, native red squirrel populations are currently on the increase. Any reduction in the pest grey squirrel population will help the reds thrive. Another reason why grey squirrels are considered to be pests is that they enter our homes, often causing a considerable noise disturbance as well as causing structural damage to a property. Once inside a house or outbuilding, they can also damage pipes and electrical cables, creating further problems for a property owner. 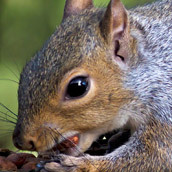 If grey squirrels enter a living area, the damage to fixtures and furnishings can be considerable. In gardens they will dig up plants and bulbs, damage fruit and vegetables, and even strip the bark from young trees. At Active Pest Solutions we undertake squirrel pest control quickly, safely and professionally, removing grey squirrels regularly from house lofts where they create damage and noise, causing stress and concern to the occupants. In Dunfermline squirrel control was required after pest squirrels gnawed what had been a small gap until it became a large opening in a soffit board of a house to gain entry. They then built a nest out of insulting materials and produced 4 perfectly formed noisy young. Squirrels can produce up to eight young three to four times a year. Elsewhere in Fife, an elderly customer asked Active Pest Solutions to carry out squirrel control in Kirkcaldy, after a pest grey squirrel killed the young blackbirds nesting in her garden. Then in Glenrothes, squirrel control was swiftly and successfully implemented to enable customers to sleep again after pest squirrels entered their attic to perform noisy nocturnal activities. Likewise, when a pest squirrel in Kinross set a company’s alarm off, we quickly dealt with the squirrel problem in order to restore the peace as quickly as possible. In all our pest control services, we observe the requisite UK legislation and always operate within the law. Approved methods of grey squirrel control that we are authorised to implement include cage trapping, spring trapping, baiting and drey poking. Free pest control surveys, undertaken by a fully qualified technician. 15 years of pest control experience. Regular pest control service visits to protect you and your business. One-off bird control visits to businesses or homes. For professional squirrel pest control contact Active Pest Solutions during business hours on 01577 862035 or email us to explain your squirrel issues. To find out what our customers say about our pest control services, check out the Fife Trusted Traders web site. We look forward to helping you with your pest control needs, however large or small they may be. Just call us during normal business hours on 01577 862 035 to ask for advice about any pest problems that are causing you concern.